The amazing Daniel Colman has done it again. The Big One For One Drop winner secured yet another high roller title last night after taking down the WPT Alpha 8 London for a £600,000 score. 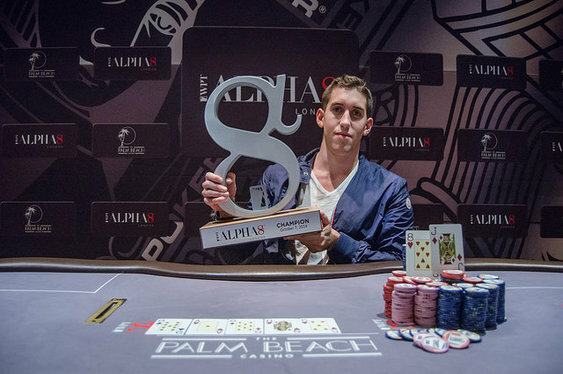 Colman was one of five players to fire a second £60,000 bullet at the Palm Beach Casino and that investment paid dividends after he beat Germany's Max Altergott to the title. Fifteen players, bought in a total of 23 times but only four of them would make the money. After the likes of Erik Seidel, Sam Trickett and Philipp Gruissem had departed it was Sorel Mizzi who would exit in the worst position of all. The Canadian departed on the bubble when his dominated Qs10s couldn't come from behind to beat Colman's KdQd. Isaac Haxton soon joined Mizzi on the rail when his KhQc proved no match against Talal Shakerchi's pocket kings. The British hedge fund manager fell in third, £224,000 to the good, when his Ad6h couldn't crack Colman's pocket queens. The American started heads-up play against Altergott with a two-to-one chip lead but the German soon battled his way in front. The pair then decided to jump straight to the 50,000/100,000 blind level and it didn't take long to secure a result. Colman won three successive all-ins to take the first WPT Alpha 8 title of the season and another massive payday. Colman's recent run is truly mind boggling. His last five live scores have been for $15,306,668 in the Big One for One Drop, $796,821 after a third in the Aria Super High Roller, $1,118,479 after finishing runner-up in the EPT Barcelona Super High Roller, $1,446,710 after winning the Seminole Hard Rock Poker Open and now the WPT Alpha 8 for £600,000 ($963,000). Extraordinary.